In an effort to scrounge up some money and declutter, I’ve recently started selling some of my stuff on eBay. This includes a bunch of my cool/rare EarthBound/MOTHER stuff that’s basically just been sitting around for years and could probably go to a better home. Right now I have a bunch of rare MOTHER T-shirts, posters, and such, and I’ll probably be adding some more plushes and stuff in the near future too. You can see what I have listed here. 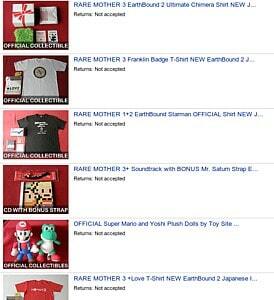 I also have lots of non-EarthBound/MOTHER stuff up (and more to add) so there’s that too if you’re interested! Awww I was hoping for the ” Welcome to th :1″ T-shirt. And some of this stuff seems handy. Damn. I don’t have money now…. I found these items on ebay a few days ago and knew it was Mato who was selling all this stuff. i wish i could have that mother 3 shirt. and walk around town with it on and that would be instant advertisement for the mother series. but i already have the ness costume from fan gamer. You’re really tempting me with some of these, especially that poster. Gah! Hey, can anyone point out for me please where I can find the “Welcome to th :1 T-Shirt? Does anyone have the mother 3 mousepad? As far as I know there is no such shirt. Yurop: I’m still not sure what mouse pad people are talking about – I couldn’t find the auction page for it, even though it should still be archived. The Mother3+ CD. It says “come on Mars, buy me”, while the price says “HAHAHA”. I love game soundtracks, but this one, man, this one. Ah well. Since I know it’s going to be swiftly spirited away in about two days, do you have any ideas how one could acquire such a find later in the future? Mato, do you have any cool stuff that is… cheaper? Like beat-up junk? I’m totally into junk. Stevesesy: send me like $15 or so and I’ll send you a box full of random knick-knacks I have that I don’t think I’d ever be able to sell for much money. T-shirts, posters, Veggie Tales? It’s yours my friend, as long as you have enough rupees! Shadow Hearts Convenant? Take my money I don’t care that I don’t own a PS2 anymore! 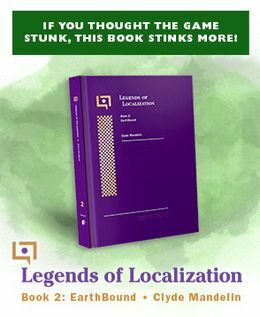 I’m actually kinda sad to get rid of that one, was hard enough to find a copy a few years ago. Got a few hours in but never found the time to continue 🙁 Maybe someday when I’m retired. 🙁 it’s kinda sad your letting all of this stuff go. Still it’s nice to see your stuff go to people who understand it’s true value, am I right? That’s a hell of a price for E.V.O. Would love to pick up another copy of this game but I just don’t find myself playing it that much. Huh. I overestimated the price of a semi-rare japanese thing. Now that’s a nice happenstance. Thanks Mato! wow, those prices are crappy. $44 for gba ff6? I pretty much just played it for like ten minutes and then never played it again, so it’s in good quality too. okay why would you be selling a brand new 3ds?? ?